Joe Tapine has been a shining light for the Raiders in an otherwise dismal season. Photos: Supplied by Canberra Raiders. They haven’t managed to beat a top-eight side all year but the Canberra Raiders will use a worthy cause as their motivation to instil some pride back in the jersey this weekend. The Green Machine face the intimidating task of tackling top-of-the-ladder Sydney Roosters at GIO Stadium but insist they can cause one of the biggest upsets of the season on Sunday afternoon and will use the chance to raise awareness and money for autism as an incentive. 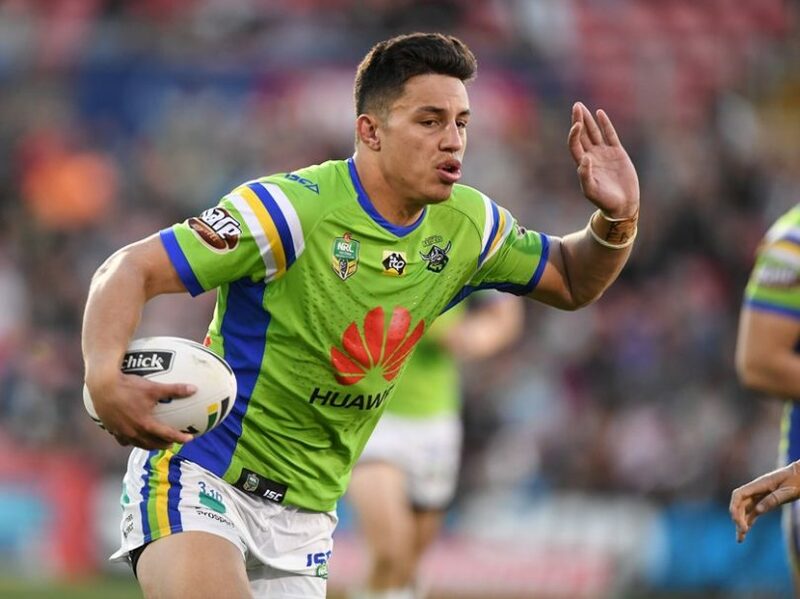 The Raiders’ slim finals chances were buried in last weekend’s loss to the West Tigers but Ricky Stuart has told his men they still have plenty to play for in the last three rounds, urging his men to put some pride back into the jersey. There is no better time to do so with the Raiders set to wear jerseys designed by 10-year-olds Kayla Marlow and Neve Smith to support Autism Wellbeing and the Ricky Stuart Foundation this weekend. Backrower Joe Tapine said the season had been a tough learning curve for the entire team but said there is plenty of motivation for the last three matches of the season. “Not making finals is hard for us. It was a big goal for us at the start of the year and we didn’t achieve it,” Tapine said. “The boys are tough on themselves and we know we have let a lot of people down but we have to come out here and try our hardest the next couple of weeks. We need to prove a lot to ourselves and the community in the last couple of games and use these games as a building stage for next year. The chance to raise awareness and money for families struggling with autism is close to Tapine’s heart, with the 24-year-old New Zealand international surrounded by friends and family struggling with the condition. Joe Tapine and Elliot Whitehead modelling the jerseys on Tuesday morning. For the third consecutive season, the Canberra Raiders major sponsor Huawei will forego their usual place on the front of the Raiders jersey, in order to raise awareness for Autism Wellbeing and money for the Ricky Stuart Foundation. Last year’s equivalent game day promotion raised over $41,000 through match-day fundraising initiatives and an online jersey auction and the Raiders are hoping to exceed that amount this season. Stuart, who is also director of the Ricky Stuart Foundation, thanked Huawei for their continued support of both the special matchday and the jersey initiative. “Huawei has shown continued and sustained support for the Ricky Stuart Foundation over a number of years and to have the Foundation and #AutsimWellbeing message feature on the Raiders jersey again this season is a wonderful way to showcase this support,” Stuart said. The match worn jersey’s will once again be auctioned through Allbids post-match. Canberra Raiders vs Sydney Roosters at GIO Stadium, Sunday 4:10 pm. 1. Brad Abbey, 2. Nick Cotric, 3. Elliott Whitehead, 4. Joey Leilua, 5. Jordan Rapana, 6. Blake Austin, 7. Sam Williams, 8. Dunamis Lui, 9. Josh Hodgson (c), 10. Shannon Boyd, 11. Joe Tapine, 12. Sia Soliola, 13. Josh Papalii. 14. Emre Guler, 15. Luke Bateman, 16. Siliva Havili, 17. Junior Paulo, 18. Jack Murchie, 19. Liam Knight, 20. Makahesi Makatoa, 21. Michael Oldfield.